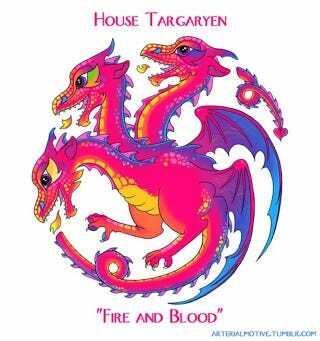 What if the famous Trapper Keeper artist Lisa Frank was living in Westros, designing all the house sigils? You'd be dying at the end of a glitter sword, and slain by pink dragon fire. Artist ArterialMotive has posted these awesome Lisa Frank sigils over on Tumblr. You should check out more of ArterialMotive's work there!